Leire Vergara: I would like to start this conversation directly with the main issue that brings us together now: a discussion about the specific undertakings of the artist, especially with regards to your own artistic practice. Klaas van Gorkum: Something that we have been thinking a lot about lately has to do with defining the concept of “practice” itself. That is to say, what does it really mean to have an artistic practice? And more specifically what does this mean nowadays? Leire Vergara: What, then, is an artistic practice today, for example with regards to a possible distinction between a work of art and an aesthetic practice? Klaas van Gorkum: Well, a simple way of looking at it is to say that you need to have an artistic practice in order to produce a work of art. Of course, this isn't entirely true, since it is conceivable to have an artistic practice yet not produce distinct works of art at all. In fact, this is what we are experiencing with regards to our projects that depend on some form of participation, or where we are dealing with notions of shared or collective authorship. A lot of the actual work we do in those projects is about negotiating our position within the network of relations that is created between the institutions, the public and us. So, perhaps what we are trying to do is to talk about different ways of working, different modes of production, in order to analyse what “the work of an artist” really means, as opposed to “the work of art”. Leire Vergara: I was thinking about Marea lately, even though I haven’t seen it again in many years, with regard to the idea of participation; and perhaps this is a way to connect this film with the Zombie project. In my own interpretation, Marea deals with the difficult task of having to represent a non-community. Marea was produced at a time when Toni Negri and Michael Hardt were projecting their own large theoretical shadow on cultural production, and their diffuse image of the multitude was represented in different social, political and cultural manifestations. And the main questions remain of how to understand the transformation of a collective in a society that, in my opinion, was at its own peak of transformation, concretely in 2001 with the fall of the World Trade Centre. The concept of Empire was immediately contested and still is today, and in a way Marea contextualises that particular moment, and those particular non-community manifestations. Of course, the question lies in what were the political actions to be undertaken by such a group. Iratxe Jaio: We learned a lot from Marea for the organisation of the Zombie project. For example, we were very much interested in the way people were mobilised under the flag of Nunca Mais. In the end, Nunca Mais wasn’t an organisation, it was never even registered, it had no official leaders and no members, it was just a flag. And a non-flag at that, since it was a kind of negative image of the Galician flag, able to address issues of national identity without becoming a symbol for one. There were interesting parallels with the phenomenon of Tute Bianche in Italy, where activists would wear disposable white overalls at demonstrations, giving up their individual identity to form a temporary collective, but without the overalls becoming some sort of uniform. The idea of giving up your individuality as an act of subversion, but without being conformist, is one of the biggest challenges we can think of. Leire Vergara: What is at play in this work is the idea of democracy, and also the concept of participation. But I am also interested in talking about the way you have been dealing with specific questions regarding national identity. For example, I am referring here to earlier works such as Monitoring the Dordtselaan, or even the piece Iratxe did in Northern Ireland, Welcome to Belfast. I think these works were really dealing with a certain form of close-up. This is something that in recent years has been a hot subject within the Dutch artistic context, for example. I am thinking about a project like Be(coming) Dutch organised by the van Abbe Museum, which was understood within the local context as being very controversial. Klaas van Gorkum: Well, the controversy is actually on the streets, in everyday life, and the van Abbe tried to confront that directly. Within Dutch culture, we can say that we never questioned our identity as we claimed not to have one. Leire Vergara: What do you mean by the idea that Dutch people never had an identity? Iratxe Jaio: That was what was thought until Pim Fortuyn was killed. Klaas van Gorkum: Yes, and all of a sudden we seemed to have this huge reservoir of chauvinism. It’s shocking! But on the other hand, this is really giving rise to interesting developments, debates and disagreements, concerning identity politics. I always thought about the Basque Country as being an interesting place, or an interesting case study, because of the way its problems and conflicts regarding identity politics are played out. This has become inverted, in the sense that for me the more challenging dilemmas regarding identity politics are now taking place in the Netherlands. Leire Vergara: So what kind of subject is the Zombie in this discussion? What kind of agency can be claimed for it apart from its well-known metaphoric references? I am thinking of its possible agency, if there is any, in regards to the type of conflicts we are discussing: between national and non-national identity subjects, between participation and democracy. Klaas van Gorkum: I suppose the non-participatory aspect of the zombie is quite relevant here. It is dead. Leire Vergara: I prefer to say half-dead. Klaas van Gorkum: It is not participating. Leire Vergara: But it has its own mode of action, its own rules. Klaas van Gorkum: No! If you go back to the classical Zombie movies, which contain some kind of reflection on, or parody of, society, you always find examples of Zombies behaving almost as normal human beings. But no matter how normal or natural the Zombie acts, no matter what it does, how far it goes in taking part in society, the Zombie is not really participating. It is a mindless monster that will eat you if it gets the chance. Leire Vergara: It is mocking certain participatory behaviour, then. Were you also interested in using irony as part of the project? Iratxe Jaio: On a certain level, the Zombie project could certainly be taken as a mockery of the political discourse on participation, especially in the Netherlands. But irony in art is a tricky subject, worthy of a discussion of its own! And I wanted to add something else beforehand in relation to the concept of the multitude. In the Netherlands we did the project in a so-called “problem neighborhood”. Usually these kinds of neighborhood are also identified as immigrant neighborhoods, or working-class neighborhoods. With the Zombie project we wanted to question these profiles, and undermine the way they are applied from the outside, from above. The way we did it was through the decision making of the participants. For us it was very important that each participant could choose what kind of zombie they wanted to be: the zombie bride, the worker, etc. So first they decided what they wanted to be and after that they had to perform their role as a zombie. This was a way to think about self-representation, but after all that there was a denial of it as well. Leire Vergara: So you were offering the participants the possibility of self-representation, but with the negation of their presumed collective identity. Let's say the immigrants, the workers, the youngsters, the tourists, etc., in such a way that their own idealism immediately confronted its opposite. Iratxe Jaio: Absolutely. In that sense, the zombie is not just a simple mask, but at least two masks. It allows you to act out individual fantasies, while requiring that you kind of ruin that fantasy for the good of the collective experience. Klaas van Gorkum: Returning to your question about the ironical aspect of the project. Irony as an artistic strategy has severe limitations, and we believe that it shouldn’t ever be a goal in itself. Leire Vergara: Perhaps a dangerous point related to irony is that it either becomes pure entertainment, or a direct lie. Klaas van Gorkum: What I find more dangerous about irony is that it excludes people and produces hierarchical divisions. As a form of humour, it depends on a shared understanding of its implicit meanings, often at the expense of those who don't. Leire Vergara: Are you saying that an art work should integrate as many people as possible? Klaas van Gorkum: Not in the standard populist way, which creates the fallacy that everyone has to understand a work of art in the same way. Leire Vergara: Walter Benjamin touches upon this issue in some texts where he reflects on a series of conversations he had with his friend Bertolt Brecht about the idea of form, and in particular in relation to the form that a work of art should have in order to approach the workers. In fact, Bertolt Brecht talks about the idea of the popular, and the process of becoming popular. Indeed, he is not using this term in a negative manner, but in a diametrically opposite way, especially if we consider that he was advocating a rather experimental formal language in order to approach the workers. I think that Brecht is talking about the idea of becoming popular as a radical and fully-committed educational endeavour, and about the need to expand the preconception of what an audience is and how it assimilates cultural/critical practices. So the issue is where we actually place the limits of any acknowledgement, and how to expand them. Klaas van Gorkum: I would even push it a little bit further, because you cannot do it alone. You need to find friends around you who share the same affinities, who are already easy to include in your own discourse. You need accomplices. That is essential for a work of art. But this could go two ways. One is to see art as a way to detach yourself from the world, where accomplices only serve to reassert the exclusiveness of those shared affinities. But this will only end up making the art world smaller and smaller. We believe instead in the other way, where it is important that an art work should allow for its re-appropriation by a widening circle of accomplices. Iratxe Jaio: I would like to make a remark here, because it seems like we are talking about the work of art as a single object. But, as we mentioned earlier, we prefer to speak about practice, because for instance what you saw in Tiempo Muerto at the Gure Artea exhibition at Artium, was just a small part of a very long process, and in fact it was directly addressed to a very specific audience. I am not saying I don’t like museums. Leire Vergara: So what for you is the object which stands in the exhibition space? Iratxe Jaio: It is another part of the strategy of getting accomplices. An object in an exhibition space is not an innocent thing, since it immediately takes part in a larger economy of objects in exhibition spaces. It answers to certain laws. But if you want to change those laws, it is not enough to just turn your back on them and stop making objects. Leire Vergara: Are you saying that that strategy is temporary, that it could change when the exhibition finishes? For me that would then be a residual object. Klaas van Gorkum: If someone decided to buy the installation, they would be buying it as a residual object, I suppose. But no-one could buy the Zombiewalk itself. So, in a way, the residual object also serves as a reminder that there was more, and that not everything answers to the laws of commodification. 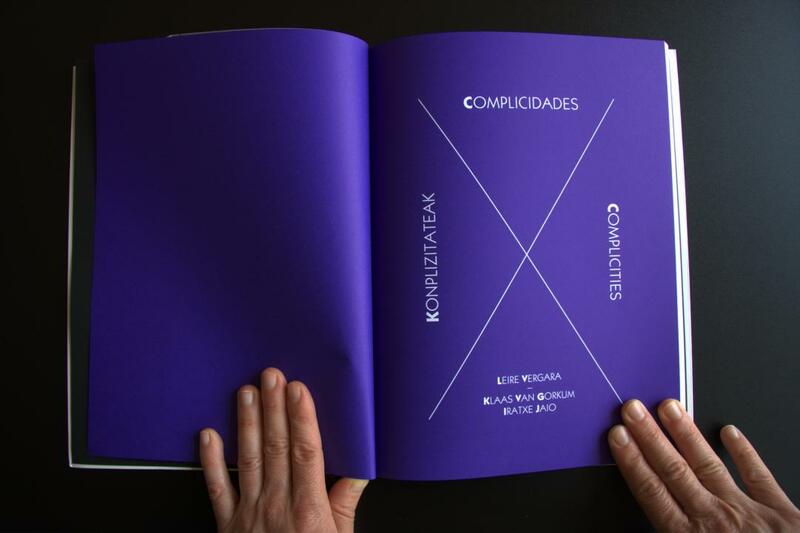 Leire Vergara: Going back to Walter Benjamin, I have been reading the essay the “Storyteller” lately, and it made me think about the specific kind of knowledge – or even better, what kind of narrative – the artist and the art work produce. But also what the narrative formats are that capitalist rhetoric makes us accept as valid, and which ones it makes us reject. I think this is really affecting contemporary art at the moment, at least in a general manner. Especially when populist preconceptions arise with regards to how the work of art should be comprehensible for everyone. I see this as a way of controlling the type of information, or knowledge, that a work of art should have. But the question is what is really framing this supposedly valid way of informing, of communicating? And what are the main goals behind it? Walter Benjamin talks about the novel or the informative report in the press as a product of Modern times, a format of narration that turned out to be very successful at the time, but that replaces other forms such as the story. So how can we recognise what kind of forms of narration, knowledge, are spelled out by capitalism, and why? And, most importantly, what should contemporary art do about this? Klaas van Gorkum: One of the recurring discussions about art in the public space in the Netherlands is how to address the seemingly unavoidable polemical reaction of the public to it. And much of that discussion then revolves around clichés on popular taste versus elitism, government spending, etc. But in a way, this polemic is a form of narration in itself. A Dutch critic once compared art in the public space to state terrorism, because no matter how democratic the state is, it is never really asking its citizens whether they want that art or not. This was a refreshing perspective for us, because it suggested that the reactions of these citizens to the art work have less to do with their appreciation of art than with their antagonism towards imposition by the authorities. Leire Vergara: You mean that this is a direct reaction against the institutional authority? Klaas van Gorkum: Yes! It is in fact an outlet for the frustrations people feel in general. It is frustration directed against power. Iratxe Jaio: There are a lot of contradictions inherent in participatory art practices and we are at a particular moment where we really need to deal with these within the art work itself. When we produced Marea, there was still a certain optimism regarding the potential of socially engaged, participatory art practices. Now we know things are not so simple anymore, and that the symbolical value of artistic production depends on more than the artist's good intentions. I mean this in the sense that talking about the function of the artist in society easily falls prey to the neo-liberal context in which we work. Klaas van Gorkum: In the Netherlands, for example, there is a tendency to justify the place of art in society, by describing how useful it is. Art as a social activator, with the artist as a social worker. The problem is not even this obsession with its functional aspect. The problem is that this function is purely symbolical. It happens too often that the mere idea of an artist at work is enough to enable some civil servant to write a little report on how the policy of activating the public through culture was fulfilled. There is a disinterest in the actual work itself, in the actual results of artistic propositions, from an institutional point of view, because in the end it is irrelevant to its internal agenda. Iratxe Jaio: It also doesn't help that artists are so eager to identify their practices with the bottom-up approach of community initiatives, since it encourages them to ignore their connection to this top-down institutional context. Leire Vergara: Do you think this is different here in Spain? Is there perhaps a different social conception of the artist? Klaas van Gorkum: Yes, but it is very refreshing not to see the artist as a social activator. This is perhaps because the policy-makers haven't developed that way of thinking yet, although we do see similar ideas evolving very fast in the Basque Country. Leire Vergara: Do you think so? I perhaps see it differently. I think that kind of social activating role is now very much played by the cultural public institution. Klaas van Gorkum: Well, it works both ways. It is not just institutions, but it is also artists who are bringing it on themselves by engaging in a certain discourse. Leire Vergara: But there are still big differences, aren’t there? I think that in Holland there has been a critical questioning of such an investment, and this comes from the artistic perspective. Klaas van Gorkum: Maybe. But what has also happened, in our opinion, is that it has become increasingly difficult to discern the artistic discourse from that of the policy-makers. They both use the same language, but they don't mean the same thing. And this has happened very fast. However, you can barely compare these two contexts. We cannot really use the Dutch model and apply it to Spain or the Basque Country as a futuristic prediction. But, of course, there are interesting parallels and that is why it was so interesting for us to do the Zombie project in both places. Leire Vergara: I have been thinking very much lately about the way institutional critique reproduces a certain romantic idea of democracy. I mean, it departs from a totally idealist scenario where institutions exist in cultural conditions that are safeguarded. I have been basically thinking about institutional critique and its function when these minimum conditions are not guaranteed. By this I am, for example, referring to places like Spain, where sometimes the institutions respond to the commands of capricious politicians. The question is what kind of democracy is implied within a practice of institutional critique, and how is this idea contested, reflected on and, of course, extended? Institutional Critique under such a preconception will be a by-product of a specific artistic, cultural and socio-political context, which is the Anglophone and Western one; and in that way of interpreting this question, we shouldn’t leave unthought the way that this type of context ends up shaping the idea of democracy. I bring this up because in certain ways your work has been very much dealing with the issue of democracy: on the one hand, unveiling the mechanisms that conform or define it and, on the other, trying to reflect on its own limits. Klaas van Gorkum: Absolutely. But it is important to keep a focus on your own subjectivity, your own perspective on the institutional context, in order not to become a product of it. This means that whether we are working in Spain or in the Netherlands, we are essentially still working in the same way, but perhaps with slightly different results. In any case, there is an institutional context above all that, whether you are directly related to a specific institution or not. Leire Vergara: You mean art as an institutional entity itself? Klaas van Gorkum: Yes, although come to think of it, it may just be another way of saying the same thing instead. Which is an interesting point I suppose: the way we, as artists, relate to art, is equal to the way we relate to the institution of democracy: as both the material consequence of a heterogeneous social reality, as well as the desired conditions of an idealized version of it.